Kakadu National Park is one of the larger national parks in the world, consisting of four major river systems and various landforms. It is the breeding habitat of the endangered saltwater crocodile and the pig-nosed turtle. Its flora is very diverse and includes 46 rare or threatened species. The park is also renowned for the richness of its Aboriginal cultural sites. 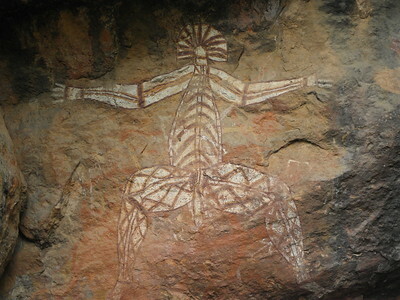 There are more than 5000 recorded art sites illustrating Aboriginal culture over thousands of years. The archaeological sites demonstrate Aboriginal occupation for at least 20 000 and possibly 50 000 years. I visited Kakadu in early April, and it was still very wet. It had rained extensively over the past months, and most of the roads were closed due to flooding. Only the two main roads through the park, the Arnhem Highway from Darwin east to Jabiru and the Kakadu Highway from Jabiru south to Pine Creek, were open. It was still raining slightly during the two days I spent in the park. Fortunately, two of the best things to do in the park are open in the wet season too: Nourlangie Rock and the Yellow Water Cruise. Nourlangie Rock is located a few km’s from the main Kakadu Highway. The road to it is sealed, and it leads up to the large sandstone escarpment that cross-sects the park – so it is accessible all-year round. There are a couple of short hikes you can do here. I did the loop walk, which takes you past the various rock paintings. Their setting is similar to these at Bhimbetka in India, which I saw earlier on this RTW-trip: they are under overhanging rocks or rock shelters. The quality of the paintings is pretty spectacular, and the images are different from rock art elsewhere in the world. Of course they display typical Australian animals like kangooroos. Several of the paintings are large images of aboriginal spiritual beings. There’s also “contact art”: paintings made after contact with European explorers, for example in the form of a gun. The Yellow Water Cruise is a commercial tour offered several times a day by the Gagudju Lodge in Cooinda. I went on the 6.45 a.m. cruise, at sunrise. Getting there so early meant a 54 km drive from Jabiru in the dark. Although driving at night is discouraged in Australia, all went well: I did not encounter nor hit any large animals. The 2-hour cruise takes you out on the Yellow Water Billabong & the South Alligator River. It is a bit like going on a safari in Africa: the rangers know where to spot the various animals and can almost guarantee you sightings of specific species. We spent the first half hour in awe looking at an eagle, pretty up-close, calling out for her mate. Then we went to visit a Comb-crested Jacana, with his 3 little chicks (the male looks after the kids). Although the park is infested by them, so far we hadn’t encountered a crocodile. We finally saw a female saltwater croc guarding the flooded spot of where she had laid her eggs. The guide had found her here every day. The scenery overall during the boat trip is very pretty, and there are birds everywhere. I did enjoy my stay in Kakadu even despite the rain and the resulting limited possibilities. The wildlife, especially the birdlife, is so abundant that you will see things of interest even from the main roads. It was also very quiet everywhere: I spent 20 minutes tracking a pair of Brolga along the main Kakadu Highway. I just left my car parked on the left lane of the road, no other car passed by. I had the great opportunity to travel from the University of Melbourne all the way to Kakadu with a group of uni students. We hiked up Jim Jim Falls for 5 days. The experience was unforgettable, as we camped under the stars only in our sleeping bags (lugging tents while hiking up the falls was not an option). I truly felt at peace, spending my days swimming and hiking. This is a heritage site not to be missed! Even though I was in Kakadu only for two days, I enjoyed it a lot. This place is immensely fascinating and truly deserves its place on the WH list. The wildlife is great - yes, you can easily spot crocodiles -, the flora stunning, and the rock carvings and paintings add another interesting feature as well. I was there during rainy season, you could hardly go anywhere without a boat, and it was raining most of the time, but still this is one of my favorite places in Australia, if not the world. I hope that Kakadu will remain the wild place it is now, since I have heard that UNESCO has reprimanded Australia for allowing mining to continue in the park. I only spent a few days in Kakadu, but I wish I could have spent a month. This is a truly beautiful place, that should be a must for all visitors to northern Australia.